In March, Twitter celebrated its eighth anniversary by giving its more than 600 million users the ability to search for their very first Tweets ever published. On July 21, 2008, at 5:39 p.m., DCI's first drum corps introduced itself on the popular social network, with nearly every World and Open Class corps following suit in the next few years. As a record of their inaugural posts, check out this list of every corps' very first Tweet of all time, as we also crunch the numbers to see which groups are most active and garner the most attention on Twitter. Is looking for fans to be part of the studio audience for the Coundown. April 9th at Lucas Oil Stadium. Getting Ready for Auditions and the 2009 Season! The Blue Knights Drum and Bugle Corps is now tweeting! Welcome to the official Blue Saints Drum & Bugle Corps! 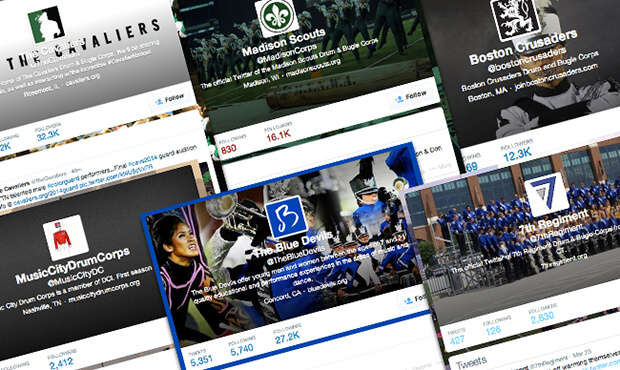 Follow us for the latest and greatest news on this DCI Open Class corps! Hello! We are in the process of gearing up our twitter site, we will start to "tweet" more often when the corps moves in in 22 days! Thanks! Getting ready for the audition camp this weekend! 3 days until the 2009 Cadets April camp this weekend in NJ - last round of colorguard and brass auditions!! The Official Carolina Crown Twitter Page is up and running! We're getting started here on Twitter! Come and introduce yourself! Just opened a Twitter for everyone interested in following the SOUND! Lunch, errands, DOING HOMEWORK AND PAPERS!!!! Hello, Tweeple! The Colts are here, getting ready for another whirlwind summer! Stop and say hello! We are now on Twitter!!!! It's about time! I wonder who has the Twitter MADISONSCOUT and whether they'll give it to me. The Sacramento Mandarins are on Twitter! Save the date! Thanksgiving week-end - site to be announced. Pacific Crest is now tweeting! Just posted a bunch of new items for 2008 at http://tinyurl.com/5zqbdy - check them out! Welcome to the official Twitter Page for the Racine Scouts Drum and Bugle Corps. Please be patient with us as we construct our page. Follow what is happening at Spirit on Twitter! Not doing anything March 12-14? Come march with us! Spots available still in all sections.